Ameghino and the Tertiary Man. Part 1. Ameghino and the Tertiary Man. Part 2. 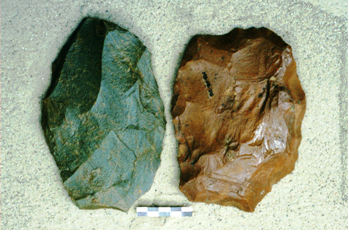 Biface hand axes are a clear indication of primitive hominin presence in a given area. These stone tools have been in use for over 2.6 Million years, the longest-used tools of mankind. Modern use (i.e. roughly since 20 kya) has been more limited since H. sapiens developed better lithic technologies which relegated the hand axe to some very specific uses in certain parts of the world. Today's post looks into the following hypothesis: Since primitive humans did not have the knowhow to make advanced tools. If these "primitive" tools are found in a context where "more advanced" toolage is absent, it means that we have found an "archaic" human site. In the Old World, these tools are associated with many pre-sapiens hominids (H. habilis, H. erectus and Neanderthals), and when they are found, the presence of these humans is accepted without any questions. However, when they are found in America... things are different. 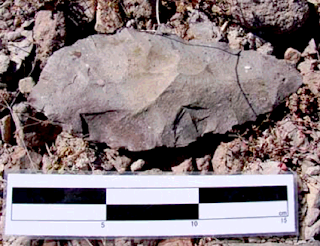 First, let's take a look at the biface hand-axe. The hand axe is a simple artifact it is a flint or obsidian pebble which has been shaped into a two-faced (hence its name, bifacial), almond shaped core by pressure or percussion knapping on its original surface to remove stone flakes (more on this below). 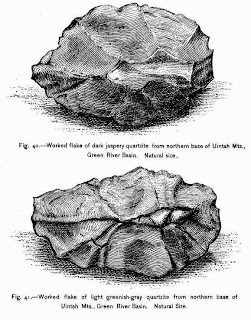 They were the first prehistoric man-made tools to be recognized as such, though it was not clear what they were used for. Its shape (axe-like) gave the impression that it was manufactued to be used as that, a primitive, coarse axe, to chop, cut, tear, dig for tubers, bugs and small animals. While ohers believe that it was thrown at prey to stun or kill them. We may never know for sure what its exact purpose was. It may have had symbolic or religious connnotations too. These axes have a longitudinal axis symmetry with a pointed tip and a rounded base (that is why they are called axes), the round area is believed to have been the part which fit into the palm of the hand of the user. 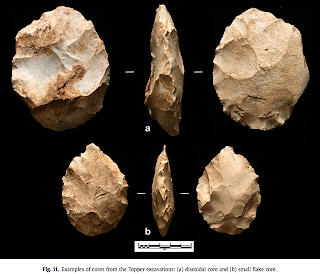 The hand-axe technology remained in use for millions of years and evolved into Acheulean toolage 1.4 mya (of H. erectus and later Neanderthal) and Mousterian tools of the Neanderthals. See some real Neanderthal axes here, these are from Eurasia. Below you will see others, from America, supposedly made by modern humans. At its height some 200 - 125 kya. Later, during the Middle Paleolithic, it was found all across Africa, Europe and Asia, even in Southern Asia, where previously it was believed to have been absent -bamboo tools were believed to have been used there instead of stone ones (The "Movius Line" marked the limit of the Acheulean tools of Western Asia). With the appearance of modern humans, it declined and during the last glacial period became quite infrequent. Despite being quite infrequent after the Last Ice Age, it is found in America, which was peopled precisely after the Last Ice Age (according to orthodoxy). Why is this so? Primitive tool among modern H. sapiens hunters in America? 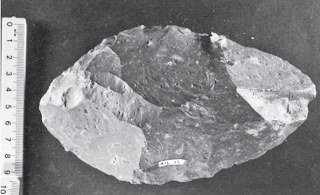 Based on the fact that to shape it, it had to be knapped and flint flakes were produced; they assumed that it was used as a blank, portable source for fresh flint tools: carried around by the hunter groups, and knapped when needed in sites where no suitable raw materials could be found to fashion stone tools from it. The core with a hand-axe shape, was just a source of other tools. They do look rather primitive to me. Since they were not dated directly, they could even be quite old. They surface as erosion wears the soil away, exposing them. They went on to add that they believed that the five cores they found which were not bifacial aces, were used as a source for raw material for other tools. They describe the axes as being 18 cm long, 14 cm wide, 1.8 cm thick and weighing 600 g, (7 in, 5.5 in, 0.7 in, 1.3 lb. ), and assumed that they were used for butchering their megafaunal prey. The site is a "quarry", not a settlement or a temporary camp, it is the place where the stones were quarried between A.D. 1000 and 1700. Yet the region has been occupied at least since 8,000 kya. Fujita calls the hand-axes "preforms". Plenty were found (78 in total), measuring on average 18.5 cm long, 9,2 cm wide and 4,2 cm thick (7.3 in, 3.6 in, 1.7 in). Since they are lying on the surface dating is uncertain, they may be much older than inferred by Fujita (more on this below). Furthermore the lack of sharp retouch edges could be due to erosion over a long period of time. These tools look old and are coarse because they were made by less skilled hominids than modern humans. Robert Gargett comments that: "from personal observation that Baja has plenty of similar 'Acheulean' archaeological occurrences"  and that he met other archaeologists at UC Berkely, (Garniss Curtis, Carl Swisher, Don Johanson and Bill Kimball) who "mentioned a tray of hand axes that had been collected in Baja California" . There is another site, G. S. Lewis- East, along the Savannah River, also in S. Carolina. . Which has what is referred to as "biface preforms" of Kirk period some 9,000 rcybp. But the way that these preforms can be turned into other tools is not very clear . These sites described above are all very "recent" and none is older than 11 kya. All are assigned to modern Neolithic humans. But why would they and not their Eurasian counterparts be the only H. sapiens to carry around "preforms" with them? "It is traditionally argued by proponents of the Movius Line that ‘true’ Acheulean bifaces, especially handaxes, are only found in abundance in Africa and western Eurasia, whereas in eastern Asia, in front of the ‘line’, these implements are rare or absent altogether..."
The above is, in my opinion, valid for America: Acheulean tools are not recognised as such when found in the New World. 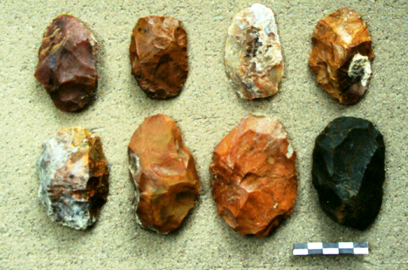 Instead they are interpreted as "preforms" or "bifacial blanks" made by modern Neolithic humans. That is what Ebert (1992:78, ) did, when he reclassified some evidently Acheulean tools found in Green River Valley, Wyoming, as blanks or preforms for other tools. Levallois stone tools are made by flaking the flint stone to shape it like a tortoise shell (which is what I see in the image below). The Neanderthals developed this technology about 250 kya and it evolved into the Mousterian technology some 100 kya. Two different tools from Green River, From. . 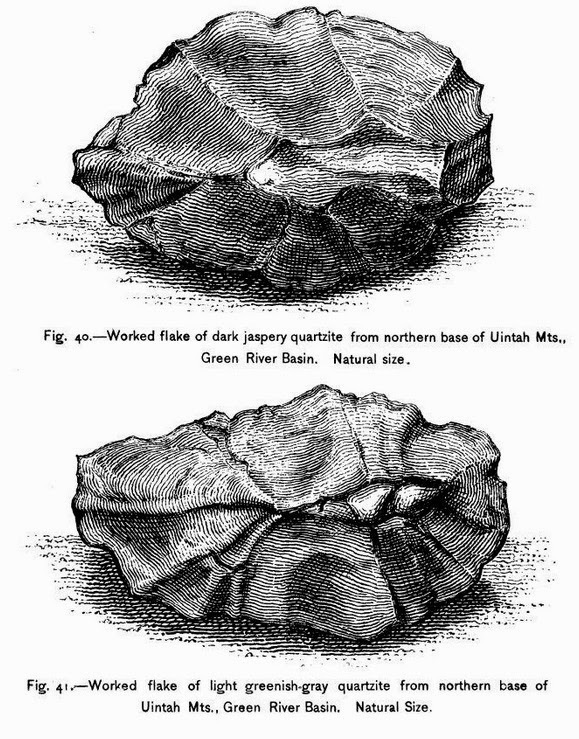 The Green River basin tools were assumed to be recent even though Jones remarked that the contemporary Indians had no knowledge about who made them, a clear indication of an ancient origin. Of course some of these tools were found close to other more modern tools. But, I believe that since nobody is actually looking for a Neanderthal-made tool in America, they will always be classified as made by H. sapiens. No one really bothers to verify their antiquity (that is +40 kya) and they are always taken as being some 10 kya!. Harami Fujita, (2009). Rhyolite bifacial preform production at El Pulguero a prehistoric Quarry and workshop site in the Cape region of Baja California. SCA Proceedings, Volume 22 (2009). Gargett, Robert H. Saturday, 19 January 2013, More North American 'Hand Axes'. The Subversive Archaeologist is licensed under a Creative Commons Attribution-NoDerivs 3.0 Unported License. op cit. Friday, 18 January 2013. And The Winner Is... Biface! Miklos Szabadics Roka, (2010), Puntas Clovis en Venezuela. Cazadores especializados Clovis en Paraguaná, Edo Falcón Venezuela. Brumm, A. & Moore, M. W. (2012). Biface distributions and the Movius Line: A Southeast Asian perspective. Australian Archaeology, (74), 32-46. Jones William Albert et alReport upon the reconnaissance of northwestern Wyoming, including Yellowstone national park, made in the summer of 1873. pp. 260. Ebert, J.I., (1992). Distributional Archaeology. Albuquerque: University of New Mexico Press. Kenneth E. Sassaman, Randy Daniel and Christopher R. Moore, (2002). G.S. Lewis-East: Early and Late Archaic Occupations Along the Savannah River, Aiken County, South Carolina. South Carolina Institute of Archaeology and Anthropology, University of South Carolina. Aside from the examples you mention, there are a few others from North America, notably from the calico hills,manix lake digs, whose age is undeniable but yet unaccepted. There is also the gentleman from Phoenix, who has found what appear to be auchelean tools. I'll dig up a link for that. Also there were a couple of tribes, in southern cal, that never developed blade based or projectile point technologies, while their neighbors had sophisticated lithic technologies. These tribes, whose names escape me at the moment, used only fairly crude hand axes and cobble based choppers. I have a very old hand axe. I picked it up from a rancher in Baja Calif. Sur while coming north from San Jose Del Cabo in 1996. It is by facial, round, like a tortoise shell, about the size of a tennis ball with a thumb notch. It has been worked on all edges and is made of what appears to be granite. I am looking for a time line for it and the makers. Thanks for your comment. Can you mail a photo? Here is a link to KC Stantons blog about his finds. Yes, if you can find the link for the Phoenix find, I would be grateful. Interesting.... two groups living next to each other with completely different technologies! Very well done, indeed! Patagonia has always been fascinating to me, also. But I live in Alaska, and here I stay. I'd be proud to write such a research paper. Here is the link to the Kc Stanton blog on possible auchelean tools. He also has an entry about such possible tools from Washington.